The 44th International Chess Tournament “Bosna 2014″ took place from 30th May to 6th June, 2014 at the Radon Plaza Hotel, in Sarajevo, the capital and largest city of Bosna and Herzegovina. GM Aleksandr Rakhmanov (RUS) was convincing in Open A (for players rated over 2300 ELO). 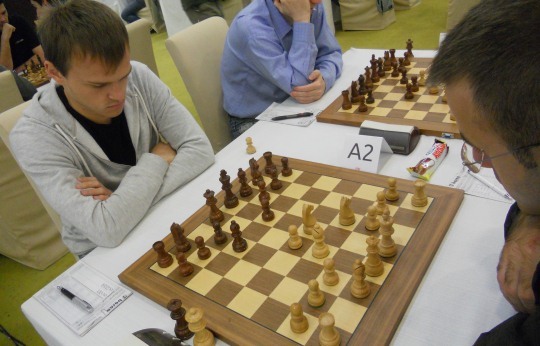 The Russian Grandmaster emerged clear winner with 7/9 points, performing at 2773 ELO. The runner-up GM Matej Sebenik (SLO) took the silver with 6,5/9 points, leaving the nearest followers half a point behind. Third place was shared in a three-way tie by the Croatian GMs Zdenko Kozul, Hrvoje Stevic and Mladen Palac, but the former European champion for men Zdenko Kozul took the bronze on superior tie-break score. Open B (for players below 2300 ELO) was won by Amar Salihovic (BIH) with 7,5/9 points, who added full 30 points to his ELO rating. Second place was shared in a three-way tie by IM Rajko Bogdanovic (BIH), Goran Vajic (BIH) and WFM Mila Zarkovic (SRB) with 7/9 points.